On February 9, 1975, the Reverend Dr. Charles R. Vogeley was Ordained into the Holy Ministry of Word and Sacrament and installed as Our Savior’s fifth pastor. This Ordination and Installation was by the Reverend Dr. Rudolph P.F. 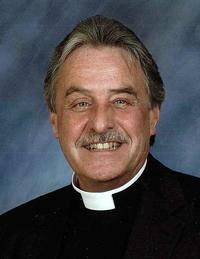 Ressmeyer, former President of the Atlantic District of the Lutheran Church – Missouri Synod (LCMS) and later Bishop of the East Coast Synod of the Association of Evangelical Lutheran Churches in America (AELC). Brooklyn-born and LI-raised, the pastor married Jean (Ocker), a native of Plainview and of the Church & School of the Good Shepherd – Lutheran. Jean retired in 2011 from teaching K-5 Physical Education at Guggenheim Elementary School. Jean and Pr. Charley are blessed with two adult children and one granddaughter. McKenna Rose was born to Elizabeth & Bryan on January 9, 2013; Bryan is the 2nd assistant chief in the Port Washington Fire Department. Lisa Vogeley currently resides in Walnut Creek, CA; she is the women’s lacrosse assistant coach at St. Mary’s College of California in Moraga. The pastor received a Bachelor of Arts (B.A.) degree with a major in Classical and Biblical Languages and a minor in English literature from Concordia Senior College (LCMS) in Fort Wayne, IN in 1970. The following fall he entered Concordia Seminary, St. Louis (LCMS) and graduated with a Master of Divinity (M.Div.) concentrating in Biblical exegesis from Christ Seminary – Seminex 1974. His Clinical Pastoral Education unit was at Immanuel Medical Center in Omaha, NE followed by a parish internship year at Holy Cross Lutheran Church in Los Gatos, CA. In 1992, he was awarded a Doctor of Ministry (D.Min.) in Homiletics from the Lutheran School of Theology in Chicago (ELCA). Thanks to a four month sabbatical by the congregation in the fall of 2002 and pastoral coverage by the sainted Reverend Dr. C. Thomas Spitz, Jr., he successfully completed a Master of Sacred Theology (S.T.M.) degree at the Lutheran Theological Seminary at Philadelphia (ELCA) in 2004. He recently returned to the Board of Directors of LI Lutheran Middle & High School in Brookville. He is formerly an adjunct religion instructor at Lu-Hi; Chaplain and Board member of Nassau Lutheran School in Mineola; Dean of the West Nassau Conference of the Metropolitan NY Synod; and, Board member of the Kimmel Foundation. He served, since the 1980’s, as President of the Port Washington Clergy Association and as President of Landmark on Main Street Limited Partnership until 2015, when he stepped down from both positions, but remaining with both organizations. He is a member of the Town of North Hempstead’s Board of Ethics, and serves as a senior housing consultant. in addition to 2015 being the congregation's 100th anniversary, it represents Pastor Charley's 40th year in serving as its pastor.